OK, so most people wouldn't describe the impressions below as "flippant." Honestly, I only used the word in the headline above because I liked how it complemented the "Flip" in Mighty Flip Champs DX. 1. I really like how this game sounds. The trance-y background tunes are nice, but they're not what I'm talking about here. Instead, I'm talking about the Donkey Kong-esque (or Mario Bros.-ish, if you prefer) sound effects that accompany the protagonist's every step. 2. I also like how it looks. The above-mentioned protagonist, Alta, and her fishman friend, especially. Both are wonderfully realized and animated sprites that hark back to the 8-bit era. 3. That said, I wish I could see the game's graphics more clearly. Everything is so small that it's hard to fully appreciate the sprites that the folks at WayForward took such pains to create. 4. 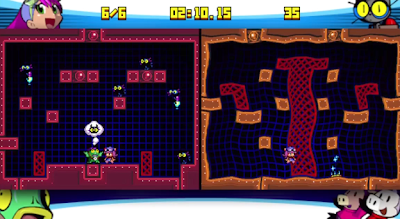 The main reason everything is so small is that the game's developers had to cram two of each stage's "pages" (areas) onto the PSP's otherwise-roomy screen. 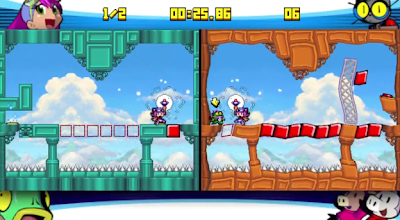 Although that negatively impacts Mighty Flip Champs DX's graphics, it positively impacts its gameplay (since it allows players to easily see where Alta will be positioned post-flip). 5. Mighty Flip Champs DX may look cute and cuddly, but it's got some serious teeth (i.e., it's tough). The first few stages are so easy that you'd be forgiven for thinking the whole thing is a cakewalk. Then you come to, oh, stage 1-7 and that notion is blown to smithereens as you try again and again (and again, if you're me) to reach Alta's amphibian compadre. 6. The only element of the game that I'm not so sure of at the moment is its emphasis on replaying each stage over and over in order to get the best time. Personally, I'm more of a beat-a-stage-once-and-then-get-on-with-it kind of guy, although I'm sure there are a lot of people who like this sort of gameplay. So, that's what I think of Mighty Flip Champs DX after playing through its first two worlds. I'll write up a more formal review of the game after I've finished it. In the meantime, have any of you played it--or its DSiWare predecessor? If so, what do you think about it? I had no clue about this game for the PSP! Something I should definitely pick up next week! WayForward is incredibly versatile and it seems like they handle something that looks this cute well. Since the 8-bit era, it's hard to find games that are both cute and incredibly difficult in this day and age. Have you tried their demo for their Bloodrayne game? It's probably the first WayForward game I didn't really care for. Well, I'm glad I could make at least one person aware of this version of the game! The funny thing is, Mark, I didn't know about it, either, until a few weeks ago. Anyway, it's definitely both cute and difficult -- the latter, especially! I've already had to turn to YouTube for a solution to a stage :\ That said, I'm loving it. I haven't tried Bloodrayne, by the way. I'll have to check it out soon, though, just to see if I feel as you do about it. The next WayForward game I'm looking forward to is Aliens Infestation for the good ol' DS. It looks great! I played into world two or three, maybe? It got WAY HARD, so I let it slip. It's still on my 3DS, so I'll give it a whirl again sometime, I'm sure. Oh, and I got Mighty Milky Way just the other day. Meh. Not the greatest game. Kind of cute, but the gameplay is sort of unforgiving in a not-so-user-error way. Oh, yeah, Justin, it is *hard*, isn't it? Honestly, it's too hard for me at this point -- my brain has a hard time seeing the solutions starting in the third world. (Hell, I had a hard time in the second world!) Still, I like it, I appreciate that WayForward made it challenging. Too many games like this are cakewalks these days. As for Mighty Milky Way, can you tell me how it plays? I haven't seen it in action myself. I like what I've seen of the graphics, though. Anyway, sorry you aren't enjoying it thus far. Well, you play as a cute alien girl that speaks in french, which I think is pretty quirky and fun, but you launch from and create planets on your way from the start of the level to the goal. You can control the speed that the girl walks around the outside of the planets, but you can't control her direction. It's largely trial and error, honestly. You have to launch yourself with the perfect trajectory to make it from planet to planet to the goal without being zapped by the borders of the level or killed by an enemy.